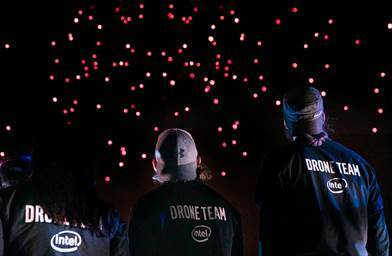 Intel Corp. broke the Guinness World Record for most unmanned aerial vehicles airborne flown simultaneously while putting on a brightly coloured light show earlier this week. The performance, which involved 2,018 drones, was in celebration of Intel’s 50th anniversary and ended with the company’s logo being flown over its Folsom, Calif. facility. The processor company used its Intel Shooting Star drones, which are specifically designed for entertainment purposes and equipped with LED lights. They can be programmed to create any type of aerial animation, and are all controlled by a single pilot. This is not the first time Intel has shown off its Shooting Star: the drones were used during the 2018 Pyeongchang Olympic opening ceremonies; Lady Gaga’s 2017 Super Bowl Halftime Show; and, as IT World Canada sister site ITBusiness.ca reported in January, they are also partnering with Ferrari Motor Sports for car races. “Several years ago, we had an idea of flying drones forming the Intel logo over our corporate headquarters, and here we are doing just that. It really speaks to the innovative spirit that Intel was founded on 50 years ago,” said Anil Nanduri, vice president and general manager of Intel Drone Group in a press release. The world record was previously held by Xi’an City Wall in China, which flew 1,374 drones in April of this year. Intel’s 50th anniversary celebrations come during a tough year for the company, which is still experiencing fallout from the Meltdown/Spectre processor flaws and the recent resignation of former CEO Brian Krzanich. Despite the struggles, Intel seems focused on the future. “We celebrate the past icons, but mostly we look forward, as they did. To create the future, improve lives and solve the world’s biggest challenges,” said chief engineering officer, Murthy Renduchintala in a blog post. Intel plans to continue its celebrations with another drone show this weekend, this time featuring only 500 drones over its Santa Clara, California corporate headquarters.